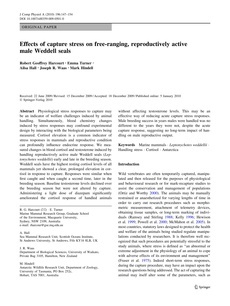 Abstract Physiological stress responses to capture may be an indicator of welfare challenges induced by animal handling. Simultaneously, blood chemistry changes induced by stress responses may confound experimental design by interacting with the biological parameters being measured. Cortisol elevation is a common indicator of stress responses in mammals and reproductive condition can profoundly inﬂuence endocrine response. We mea- sured changes in blood cortisol and testosterone induced by handling reproductively active male Weddell seals (Lep- tonychotes weddellii) early and late in the breeding season. Weddell seals have the highest resting cortisol levels of all mammals yet showed a clear, prolonged elevation in cor- tisol in response to capture. Responses were similar when ﬁrst caught and when caught a second time, later in the breeding season. Baseline testosterone levels declined over the breeding season but were not altered by capture. Administering a light dose of diazepam signiﬁcantly ameliorated the cortisol response of handled animals without affecting testosterone levels. This may be an effective way of reducing acute capture stress responses. Male breeding success in years males were handled was no different to the years they were not, despite the acute capture response, suggesting no long-term impact of han- dling on male reproductive output.